Even before I fell in love with Lime essential oil, I added copious amounts of lime juice to everything: club soda, super-limey cherry limeades, salsa, guacamole, tons of side dishes, salads, smoothies, and desserts. In my world, summer would not be summer without Lime oil. Just one drop gives you the most refreshing and bright citrusy flavor, without the uber-sourness of too much lime juice. While it's true that everything's better with lemon (no matter what the season), its cousin lime becomes my summer go-to. 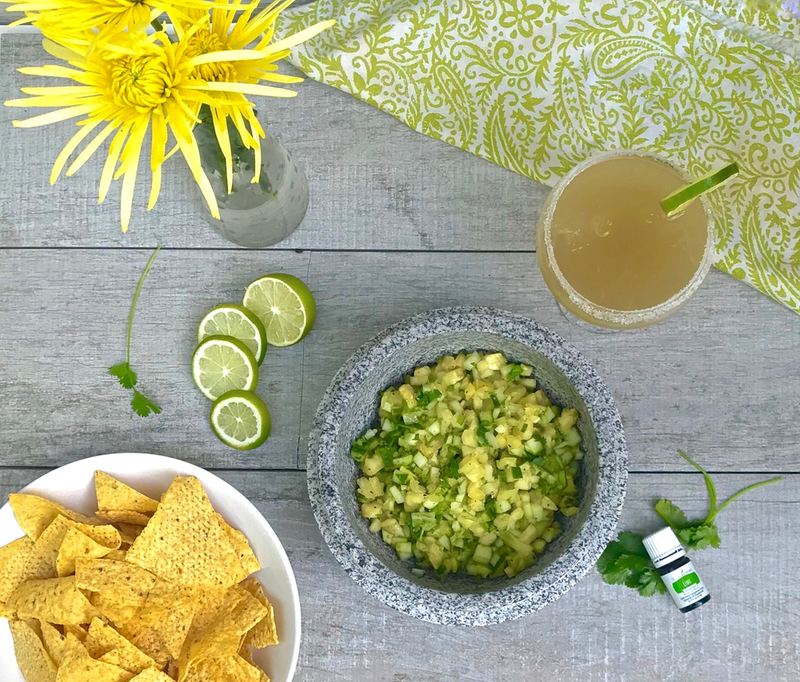 Lime Vitality oil lends it unique, summery flavor to so many drinks, Mexican foods, Asian foods, and desserts that emerge from my kitchen. the protection of cells from oxidative damage, due to its incredibly high amount of antioxidants. It has lots of d-limonene in it, as do all citrus oils. Google it - it's one powerful consitutent! Moreover, citrus oils including Lime oil have been shown in double-blind studies to lower occasional anxiety, uplift one's mood and increase one's optimism. Dr. Carolyn Mein in her Releasing Emotional Patterns with Essential Oils reports that Lime essential oil is effective in releasing the specific emotions of feeling "belittled" and "unmotivated." For these reasons, Lime essential oil is one of the main oils in the blend StressAway (which is included in the Premium Starter Kit!). This amazing blend is a must-have if you're a human with blood pressure, heart rate, and emotions. It smells like a tropical vacation, but due to the oils that were carefully selected for the blend, it probably can do your whole system a whole lot more good than you ever imagined possible with just a few drops. All the studies on citrus oils and their effects on the human brain, stress responses, and mood assessed the effects of inhalation of those oils. Rubbing a drop between your palms, putting a drop on diffuser jewelry, or using a diffuser are all methods of inhalation. This means that those tiny, powerful molecules are going airborne and straight up your nose, coming in contact with your brain. This affects your limbic system - which houses the seat of your emotions and your flight-fight-freeze response. So cool! Now let's get down and party with Lime! This little bottle is sure to give your summer gatherings that "WOW" factor with just a couple drops. You definitely won't want to run out of this summer staple. Grab a free one in May with a 100pv Essential Rewards order! When plain old water just doesn't cut it, add some bubbles. Then add a drop or two of Lime Vitality oil. It will change your life. Protein, greens, antioxidants, good fats, and a healthy dose of d-limonene...all in one smoothie! The Vitamin C in the blueberries helps you absorb the iron in the spinach, and the good fat in the coconut oil helps you absorb the Vitamins A & K in the spinach. Add ingredients to blender, putting the spinach in first. Blend well and drink from a GLASS, not plastic, cup. Chop the pico ingredients and combine in a bowl. Whisk the dressing ingredients in a glass jar, drizzle over pico, and serve. Combine ingredients in a cocktail shaker with ice. Shake for 15 seconds (or- blend with 1 cup ice in a high-powered blender) & serve in salt-rimmed glass. Squeeze the lime wedges over ice, and add Lime Vitality oil, gin, and tonic water. Stir. So there you have it - seven reasons to invite Lime Vitality to your next summer shebang. Many more recipes to come!